I came across this little history of Harborne when I was looking for something else and, as I got drawn into it, thought you might enjoy it too. It’s taken from Showell’s Dictionary of Birmingham, always a delight to rummage through. There’s a copy in the Local Studies Centre at the Library of Birmingham, 4th floor. If you’re there or thereabouts for a visit it’s worth finding out, I believe it’s usually kept on the bookshelf that faces the glass doors into the Wolfson Reading Room. Harborne did not become part of Birmingham borough until 1891. Before that it had fallen into the boundaries of Staffordshire County. Showell’s was published by the Cornish Brothers around 1885. This item was taken from Birmingham Daily Post, October 11th 1858. Available to view by subscription to the British Newspaper Archives. Birmingham’s historical newspapers can also be viewed free of charge in Local Studies at the Library of Birmingham, 4th floor – please support our local libraries and archives. A couple of weeks ago I signed an on-line petition that was calling for a change in a certain government policy. On reaching 100,000 signatures the petition was then presented for debate in Parliament and the response made public. All British citizens can take part in petitioning the government on any subject that they feel strongly about, it is a tradition that goes back hundreds of years and was particularly popular in the early part of the 19th century, the so called ‘Age of Reform’. 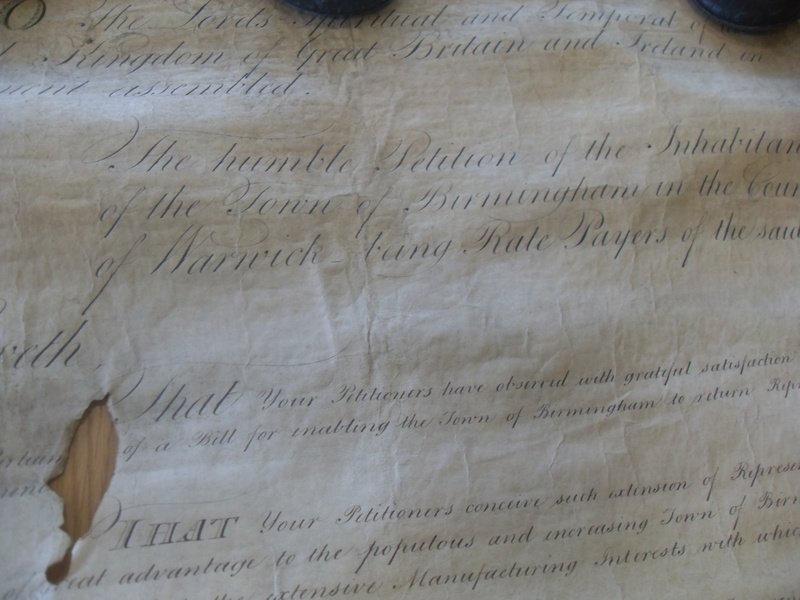 Petitions from Birmingham during this time included one in 1812 demanding an end to trade embargos (as a result of Orders in Council) that were having a negative impact on the town’s trade with America and another around the same time calling for the repeal of the East India Company’s charter. Other large manufacturing and port towns, such as Manchester, Liverpool and Bristol, also petitioned and as a result both policies were repealed. Petitioning could be a powerful political tool, especially when combined with outbreaks of popular unrest. Petitions then were, of course, hand written and signed. 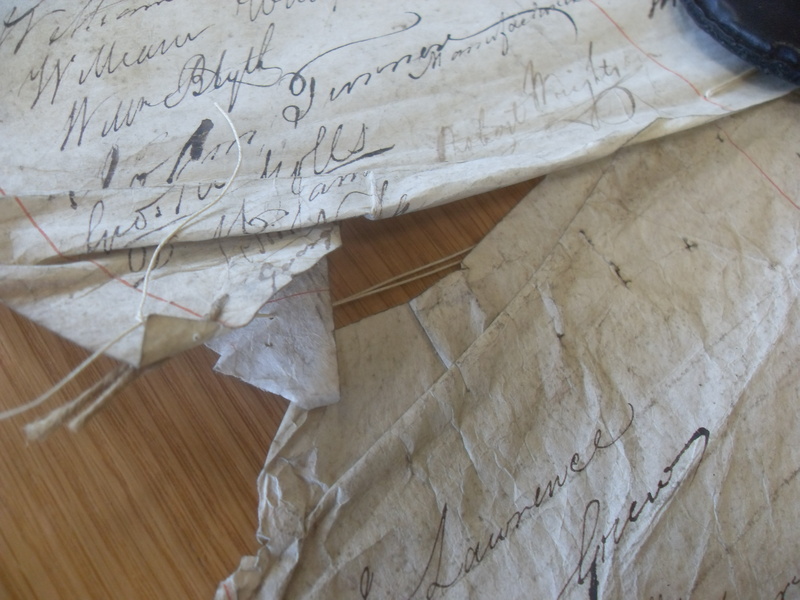 On a recent archive trip I was lucky enough to see an example of an original petition. 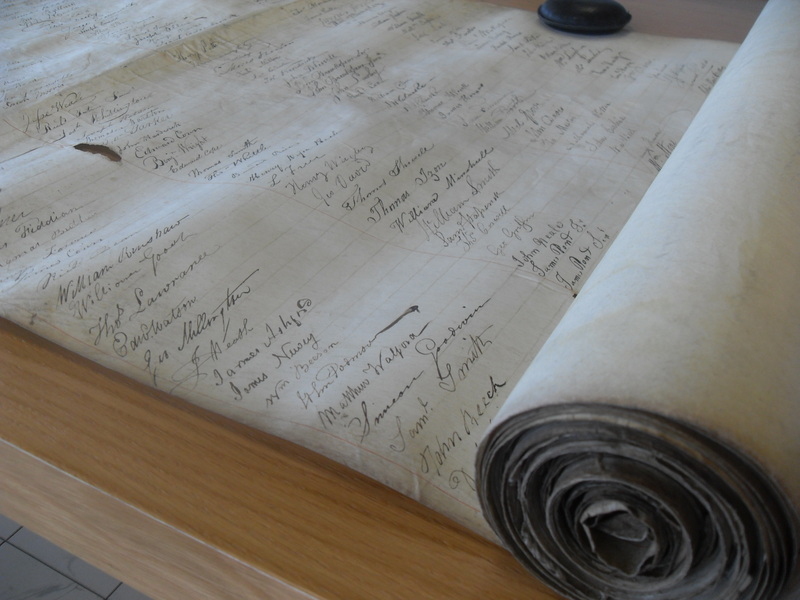 As you can see it was quite a chunky scroll, but with the exception of a few holes along the paper between the signatures, is in great condition. It was fascinating to see. 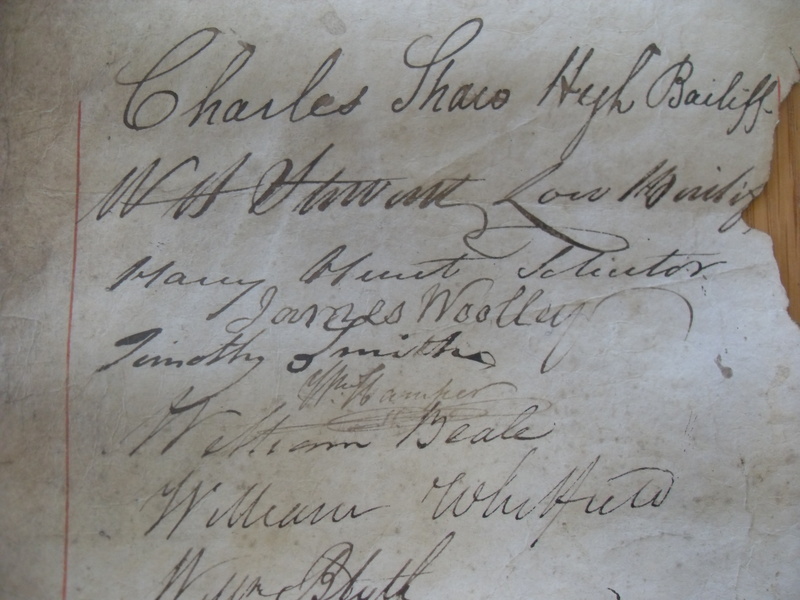 This particular petition can be dated to 1828, because the first signature is that of ‘Charles Shaw, High Bailiff’. Bailiffs were elected annually and Aris’s Birmingham Gazette published their names around the same date each year, so it was pretty easy to trace. This is a great resource. But why is it in Birmingham, and not tucked away in a Parliamentary archive? Well, in 1828 there was an attempt in the House of Commons to have the Nottinghamshire constituency of East Retford disfranchised (that is, they would lose their MP) following decades of alleged electoral corruption. There was a suggestion that one of the big industrial towns that did not have an MP could instead be given the East Retford seat; the two towns primarily tipped for the transfer were Manchester and Birmingham – and Birmingham set about gathering signatures requesting that it be given the Parliamentary seat. In the end, East Retford retained its MP for another few decades, while Birmingham and Manchester would have to wait until 1832 to realise their ambition of representation. As a result, the petition was never delivered to the House. PLEASE SUPPORT OUR LOCAL ARCHIVES, CURRENTLY SUBJECTED TO SEVERE CUT BACKS AND ALWAYS UNDER THREAT. YOU CAN FIND UPDATES BY FOLLOWING THE FRIENDS OF THE LIBRARY OF BIRMINGHAM ON TWITTER AND FACEBOOK (@FoLoB_) – thanks.